Squared, off-the-shelf kitchens which are designed for houses are generally not an ideal solution for boat galleys – both in terms of aesthetics and efficient use of space. The composite chipboard/mdf which is used to create most kitchen carcasses is ill-suited since it responds badly to moisture. We sometimes use standard kitchens for really large widebeams if the customer requests it – but usually upgrade the doors to improve on quality. Chiselpig fit galleys to suit all budgets with a range of layout and style options. 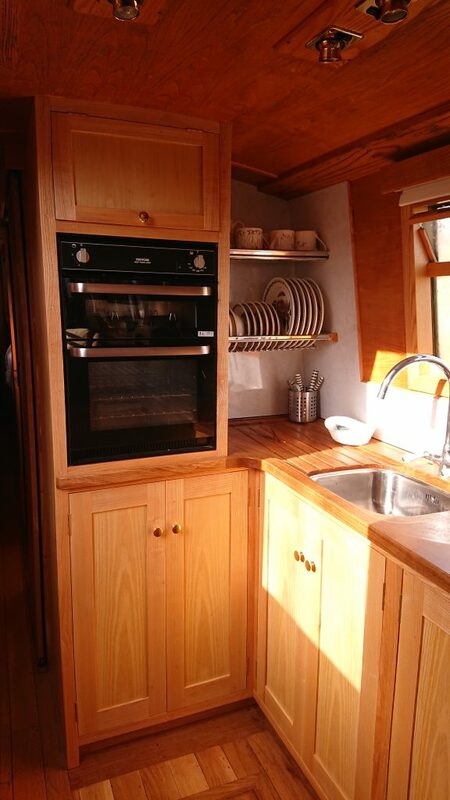 The galley is often central to the boat and therefore we think that it is worth spending some time and money getting it right to fit with your boat and your style. Lack of space and restricted outlets in terms of plumbing and electricity, can often lead to innovation and unusual solutions. 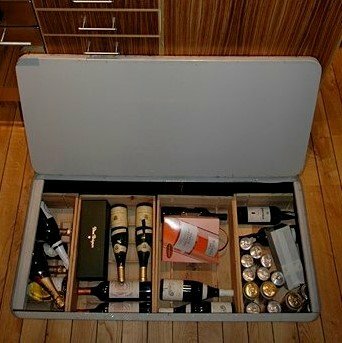 Take for example our wine cellar that is inbuilt in to the floor – a place where the wine can be kept cool and secure without any use of refrigeration – as well as easily accessible! 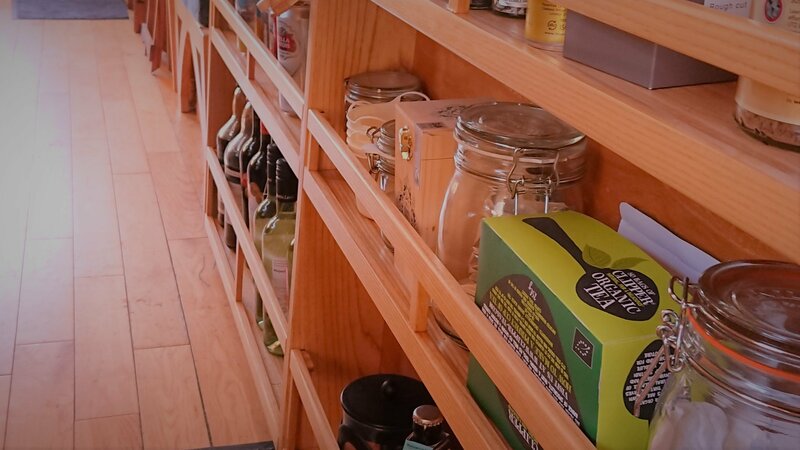 We make use of every bit of space, including gunnel-width shelving with miniature railings to secure items. Knowing that the worktops can be the most visible item of the kitchen, Chiselpig excel in producing worktops in wood that are ergonomically carved to match the curved cupboards below. 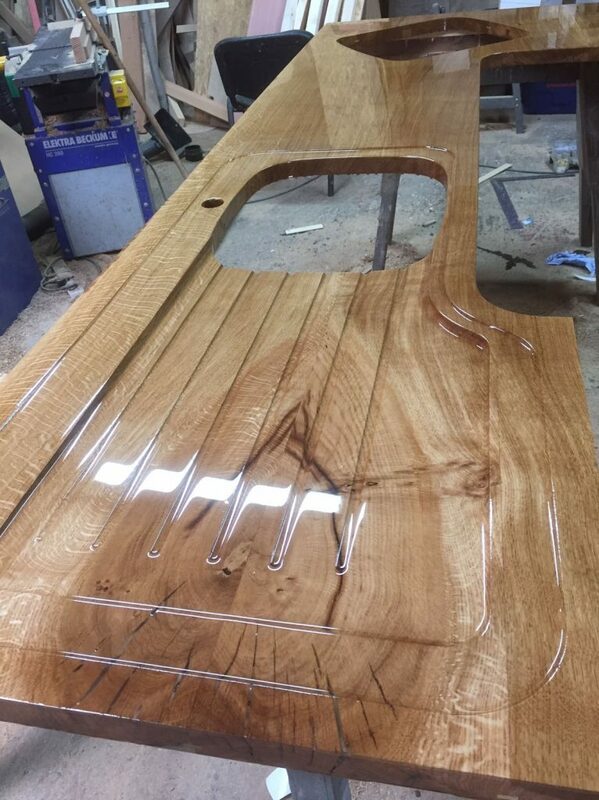 All tops are treated with two-pack or epoxy in order to make them durable and fit for purpose. This picture shows a worktop made out of a fine piece of English Oak with an integrated draining board machined to produce a ‘cohesive’ and unbroken line. Our workshop is in Devizes, Wiltshire close to the K&A. From here we have the capacity to work on two large boats undercover. We also work along the towpath, typically beside the Kennet & Avon Canal, River Avon and River Thames.